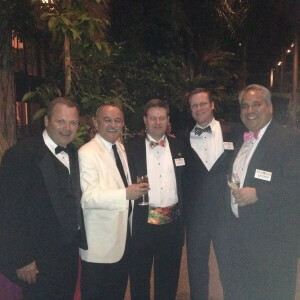 The Kennett Square Pennsylvania service club, Longwood Rotary has scheduled its annual fundraising Gala on April 9, 2016 and has selected the them “The Roaring Twenties.” The venue is, once again, the world famous Longwood Gardens Conservatory. Dress is black tie optional. The Gala will begin at 6:30 p.m. with shuttles transporting guests from the Visitor Center to the Conservatory will they will enjoy Open Bar and Hors d’Oeuvres. At 7 p.m., the Dinner Stations and Dance Floor will open with live music from the ecletic jazz band Gin Canaries. Later in the evening musical entertainment will be provided by DJ Dave Moore. The Gala ends at 11 p.m. Throughout the evening, guests will have the opportunity to bid on over a hundred Silent Auction items including art, trips, baskets and many specialty items including unique experiences with Longwood Rotary Club members. All proceeds of the Longwood Rotary Gala help to fund the many non-profit organizations and other charitable endeavors that the Longwood Rotary Club supports. For example, proceeds from previous Galas helped renovate the Kennett Senior Center Bookstore and funded construction of the Kennett YMCA Rotary Leadership Tower. Click here for more information or to purchase tickets to the 2016 Longwood Rotary Gala. For local businesses, there are also several ways to support the Gala and, at the same time, promote your business including buying an ad in the Program Book, sponsoring portions of the Gala or donating a Silent Auction item. Contact Tim Rayne at [email protected] for more details.